Giljagaur (Gully Gawk). Giljagaur, despite being the biggest of the lads, is a tad shy and hides in gullies and ravines waiting for an opportunity to sneak into houses and cowsheds to steal milk. He also has a penchant for singing, so if you see a lad with a belly, a milk moustache and singing loudly, it will be Giljagaur. 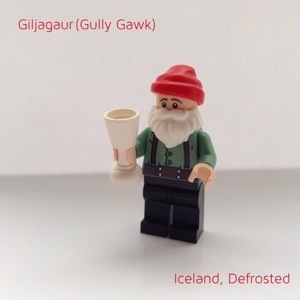 Giljagaur arrives on December 13 and departs on December 26.